Kentucky has a rare luxury this spring, returning starters. That can be said for about every position except quarterback. All of the potential candidates are inexperienced, so Darin Hinshaw must be more patient than in previous years. 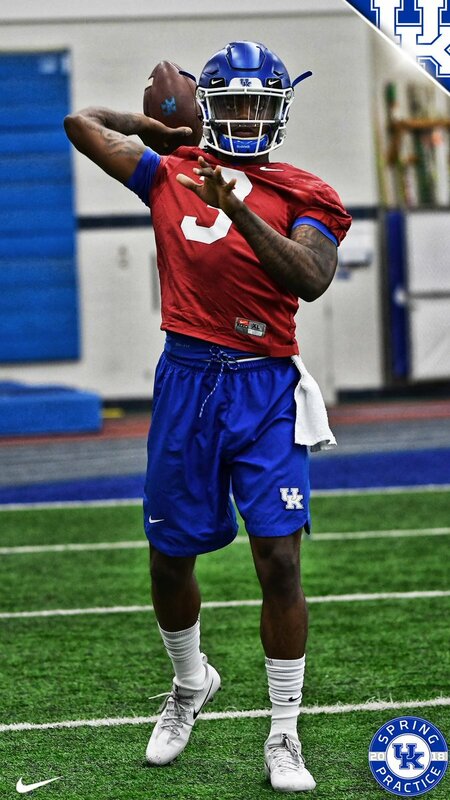 “Having somebody that hasn’t played in an SEC game, we have a learning curve that’s a little bit different than from what we’ve been in the last two years,” the passing game coordinator said after UK’s second spring practice. After spending two seasons with the team full-time, Gunnar Hoak is taking all of UK’s first team reps. The second team reps are being split by JUCO transfer Terry Wilson and redshirt freshman Danny Clark. After the lefty spent his redshirt season on the scout team, he shares a similar learning curve with Wilson. Returning from injury, Walker Wood just recently began throwing medium-range passes and is not expected to take team reps until the middle of the spring season. Terry Touchdown came to Lexington with lofty expectations, expectations he cannot meet right away. Wilson must walk before he can run. So far, so good. The concepts Wilson is learning from Kentucky’s playbook are not new, but the terminology is. He admitted it has not been easy. While many fans dream of big plays from Terry Touchdown this fall at Kroger Field, he is not thinking that far into the future. He’s not even thinking past tomorrow. While Wilson learns the offense alongside Clark, Hoak is doing everything he can to separate himself from the rest of the pack. Right now the quarterback picture is cloudy, but Hinshaw expects to see exceptional growth from the quarterbacks throughout the five-week spring season. Hopefully they stand behind the center. Under center? Behind the OL? KSR is all in on Wilson. When can we expect a big photo of the guy who’s first team? Ever? I’m with you… see my excessively long post/questions to Nick. Hinshaw’s whining about not having a q’back with SEC reps-that’s on Stoops! Hoak was the best they had last season & didn’t get a game snap! Q1) Was Gunnar Hoak not allowed to speak with the media? Q2) If he was allowed to speak to the media did you see him during your time at the practice facility? Q3) Providing the answer is yet to both question 1 and 2 did you make an attempt to speak with him regarding his thoughts on the upcoming season and the first couple of days of practice? Here’s where I’m going with this; from the article, it would appear that you believe Wilson is going to be the starting quarterback. At this point, no one knows who will be the starting qb and if they had to play a real game this Friday it sounds like Hoak would be the starter. I feel fairly confident most of the readers would like a more balanced approach to the story. Yes, you did some good reporting but you only gave us half the story. Now if it is a case of Hoak turning down an opportunity to speak then you’ve done all you can do other than maybe some comments from Danny Clark. The coaching staff has been “drooling” over ” Touchdown Terry” ever since he committed. Write it down-he’s your starter! Like everything you said UofKFB. I’d really like to know from the coaches what’s their uneasiness with Hoak. This staff was high on him when they signed him. They like his arm and accuracy ( missing that last two seasons). Stoops said passing needs to improve over last year (played SJ hurt all season). Hoak sat all year. I agree with you KJD… it really is a head-scratcher. Late in the season last year when Stephen had to come out I thought Stoops and Gran would give Hoak at least a couple of snaps but they stayed with Barker. Maybe its a work effort or attitude issue for Hoak. I hope come fall they really push all three QBs from a passing standpoint. If Hoak is the clear winner in pure all-around passing ability (he can make all the throws) then you would have to think he would be the starter when you add in his better overall understanding of the offense. Who knows…. krautdog might be right. Gents, Gunner Hoak can’t be beat. It’s a done deal. Yes you will see TT in packages. GH is the most consistent triple threat QB we have…PERIOD!